ï»¿ Home Page of Minev, P.D. Large scale computing for problems in science and engineering. It includes the development, analysis and implementation of numerical algorithms for the incompressible Navier-Stokes equations, average multiphase flow models, free boundary problems, fluid-structure interaction, MHD and non-isothermal flows. My research interests can be summarized as follows. Fictitious domain methods for fluid-structure interaction problems. Finite element methods for free boundary problems. Finite element, spectral and spectral element methods for fluid flow and heat transfer problems. Lagrangian and Eulerian-Lagrangian algorithms using finite elements. Projection methods for the incompressible Navier-Stokes equations. Preconditioned iterative methods for linear algebraic systems. DNS/LES of transition to turbulence in free and forced convection flows. Mathematical modelling of multiphase flows. Scientific computing/supercomputing; parallel algorithms for the finite element method. For my CV and list of publications take a look here. This is a development of a shear layer instability. Separation of 21 336 particles in a viscous liquid (direct simulation). A single bubble at low Weber number. Fluidized bed of 14,000 particles in a viscous liquid (direct simulation). P. Minev, S. Srinivasan, and P. Vabishchevich, Flux formulation of parabolic equations with highly heterogeneous coefficients, J. Computational and Applied Mathematics, in press. 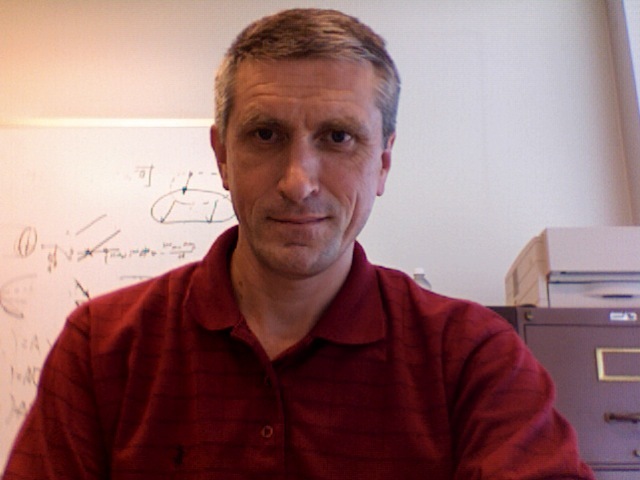 P. Minev and P. Vabishchevich, Splitting schemes for the stress formulation of the incompressible Navier-Stokes equations, J. Computational and Applied Mathematics, in press. P. Minev and P. Vabishchevich, Splitting schemes for unsteady problems involving the grad-div operator, Applied Numerical Mathematics, 124 (2018), 130-139. J.L. Guermond and P. Minev, High-order time stepping for the Navier-Stokes equations with minimal computational complexity. J. Computational and Applied Mathematics, 310 (2017), 92â€“103. J.L. Guermond and P. Minev, High-order time stepping for the incompressible Navier- Stokes equations. SIAM J. Sci. Comput., 37 (2015), A2656-A2681. A. Roshchenko, P. Minev and W.H. Finlay, A Time Splitting Fictitious Domain Algorithm for Fluid-Structure Interaction Problems . J. Fluids and Structures, 58 (2015), 109â€“ 126. P. Minev, P. Vabishchevich, An operator-splitting scheme for the stream functionâ€“vorticity formulation of the unsteady Navierâ€“Stokes equations. J. Computational and Applied Mathematics, 293 (2014), 147â€“163. S. Madhavan, Y. Y. Al-Jahmany, P. D. Minev, and K. Nandakumar, On the transition to 3D modes for channel flow past a square cylinder. Canadian J. Chem. Eng., 92 (2014), 2122--2137. T. Gornak, O. Iliev, P. Minev, A. Zemitis, A fast algorithm for 3D simulation of thermal stratification in containment pools of nuclear power plants. Computers&Mathematics with Applications, 67 (2014), 2228--2239. T. Gornak, J.L. Guermond, O. Iliev, and P. Minev, A direction splitting approach for incompressible Brinkman flow. Int. J. Numer. Analysis Modeling, 4 (2013), 1--13. J. Keating, P. Minev, A Fast Algorithm for Direct Simulation of Particulate Flows Using Conforming Grids. J. Comp. Phys. 255 (2013), 486--501. J.L. Guermond, P. Minev, A. Salgado, Convergence Analysis of a Class of Massively Parallel Direction Splitting Algorithms for the Navier-Stokes Equations in Simple Domains. Math. Comp., 81 (2012), 1951--1977. R.C. Marinez, A. Roshchenko, W.H. Finlay, P. D. Minev, Simulation of Enhanced Deposition due to Magnetic Field Alignment of Ellipsoidal Particles in a Lung Bifurcation. Journal of Aerosol Medicine and Pulmonary Drug Delivery, 25 (2012). Ph. Angot, J. Keating, P. Minev, A Direction Splitting Algorithm for Incompressible Flow in Complex Geometries. Comp. Meth. Appl. Mech. Engng. 217 (2012), 111--120. J.L. Guermond and P. Minev, Start-up flow in a three-dimensional lid-driven cavity by means of a massively parallel direction splitting algorithm. Int. J. Numer. Meth Fluids, 68 (2012), 856â€“-871. A. Roshchenko, W.H. Finlay, P. D. Minev, The Aerodynamic Behaviour of Fibers in a Linear Shear Flow. Aerosol Sci. Tech., 45 (2011), 1260-1271. J.L. Guermond and P. Minev, A new class of massively parallel direction splitting for the incompressible Navier-Stokes equations. Comp. Meth. Appl. Mech. Engng., 200 (2011), 2083--2093. R Reddy, S Jin, K Nandakumar, PD Minev and J Joshi, DNS simulations of freely falling spheres: Effect of the surrounding particles on the settling velocity and drag coefficient. Int. J. CFD, 24 (2010) , 109 - 120. JL Guermond and PD Minev, A new class of fractional step techniques for the incompressible Navier-Stokes equations using direction splitting. Compt. Rend. Acad. Sci., Mathematique, 348 (2010), 581-585. C Huang, PD Minev, J Luo and K Nandakumar, A phenomenological model for erosion of material in a horizontal slurry pipeline flow. Wear, 269 (2010), 190-196. R.K. Reddy, J.B. Joshi, K. Nandakumar, P. D. Minev, Direct numerical simulations of a freely falling sphere using fictitious domain method: Breaking of axisymmetric wake . Chem. Eng. Sci., 65 (2010), 2159-2171. A. Dechaume, W. H. Finlay, P. D. Minev, A two-grid fictitious domain method for direct simulation of flows involving non-interacting particles of a very small size. Int. J. Numer. Meth Fluids, 63 (2010), 1241-1255. You are visitor number since April 5, 2000.